Still remember Mamarazzi purchased a pot of Stevia plant not long ago? Weird plant. It kept growing taller and taller but no new branch sprout. And the existing stalk tend to be droopy coz too heavy. Hence, Mamarazzi decided to give it a hair cut. What to do with the stevia? Well, she have some Blue Pea plants in the garden that is flowering. Plucked some. Just add hot water to the Stevia and Blue Pea Flower. Stevia is a natural sweetener . Can be use to replace sugar. Do NOT pour the hot water in a glass okay. The glass will break. Use a cup or something else ya. Jeng! Jeng! I named it "Minions drink" when Mamarazzi told me about it. Papa said...squeeze some Lemon Juice into it. Wah!!!! It changes color to PURPLE! This purple drink must be for the Evil Minions leh. 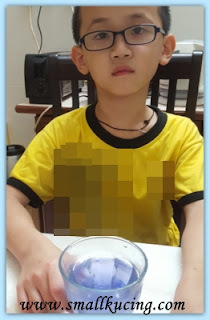 I told Mamarazzi not to give this purpule drink to Papa coz later he might turn into evil minion leh. The she asked me to drink pulak. Errr...dun wanna drink can ah? Wahaha. Minion drink. Very creative. At first I thought why minion since it was purple; not yellow. Oh. The evil minion. So, did small kucing drink the evil minion drink in the end? Look colourful lah. 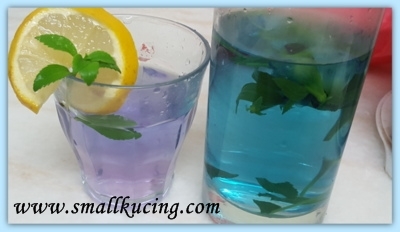 If you drink the blue one, you will become a smurf lah! No green one? Drink that and you become Kermit. LOL!!! Ummm...why mosaic on your t-shirt? Apa rahsia? Marketable right if to open a restaurant. minions drink?? errr, looks more like smurf drinks leh, hehehe.. but Uncle SK find this interesting woh, the drink is blue color and when some lemon juice was squeezed in, it turns into purple!! eih, like last time in the science lab learning chemistry, campur this to that and change color like that..
so the first photo is Stevia plant, or the Blue Pea plant?? hehe, Uncle SK blur like sotong only lah, all the plants look the same to him, hahaha!! wah, like that easy hor?? 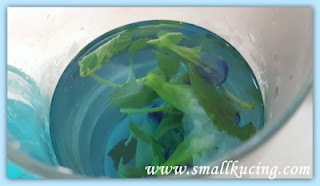 just pluck the leaves into a cup, pour hot water and can make them into nice tea, and the color really very nice leh.. 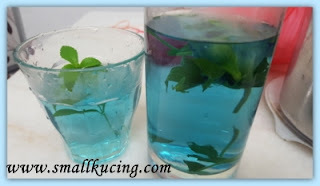 Brilliant idea to make drink with the Bunga Telang.. how's the taste? Telang itself no taste. Just have color omly. But add stevia, the drink taste sweet. If add lemongrass or pandan will be a more refreshing drink. Eh I like the purple drink! Got lemon juice inside, sure sedap.. I want, thank you! This one you can drink even if pregnant coz no sugar. It looks a pretty drink. So, in the end who ended up drinking the "minion portion"? Waiting to see if your next post show you changing into something else? Lol! Must try. 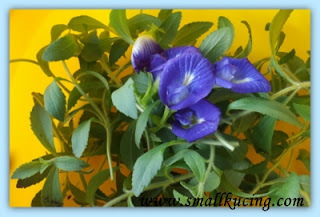 The pea is growing like the crazy but the stevia sudah bungkus, Will try with honey instead. i've not tried stevia but i've heard other people say they like it. Yes but have to be careful coz a friend's dad couldn't take stevia. we do sell the dry leaves of stevia plant. Very cheap and customers used to buy as replacement for sweetness. Yup...bought before. Only around rm5 rm6 a packet. Nice to add it into leong sui. The colour is so nice and romantic!! Brilliant drink! And a great colour for the evil Minion drink. I remember the basil that you planted was sooo much bigger and better than the small ones I managed in my previous condo. Stevia, had some with my better half, pretty good, it's natural and I've had the real leaves too during a trip. Hahaaaa got good and evil minion in this story! Very... complete. OMG! This drink is magic nectar! You will get younger by 20 years! Hey I tried to put the stevia leaves in my coffee before but it was not sweet. Did Mamarazzi give me the correct leaves or lalang??? I like the colour and so amazing that it wasn't from colouring!